Picking the right primary care provider (PCP) can be difficult, but it’s one of the most important health care decisions you can make. Patients who receive personalized care tend to make healthier life choices, focus more on prevention and detect health problems earlier. Moreover, a good relationship with a PCP lowers your risk of dying of cancer, heart disease and stroke. In other words, your PCP can make you healthier, if you choose wisely. So how do you decide? Many patients get stuck blindly choosing a provider and then hoping for the best. Often the default is a physician who accepts a certain insurance. 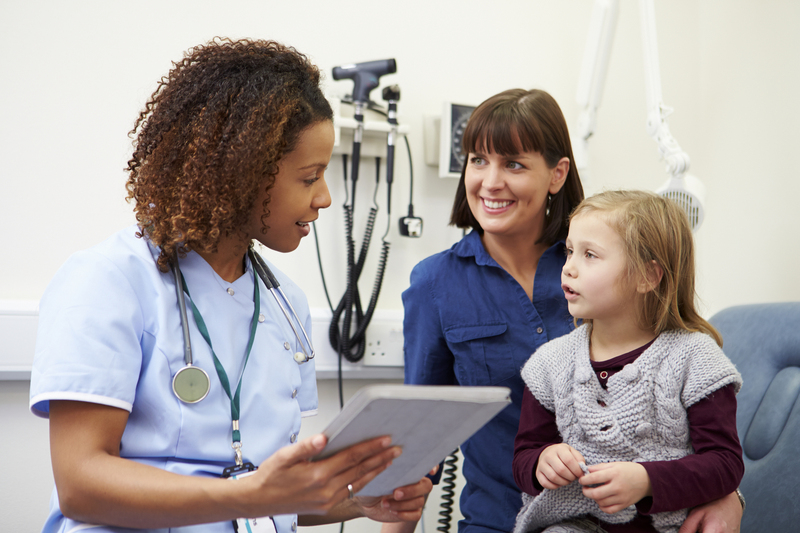 But with fewer and fewer physicians choosing to practice primary care, it’s time to consider a nurse practitioner (NP) – an equally capable provider who offers high quality, patient-centered care close to home. Increasingly, NPs are the provider of choice for many patients looking to play a more proactive role in their own health. In every state, NPs assess patients, order and interpret tests, make diagnoses and provide treatment – including prescribing medications. They can be found in clinics, hospitals, emergency rooms, urgent care centers, nursing homes and private practices nationwide, and their appeal extends well beyond their six-plus years of clinical education and training. The differences play out in big and small ways. While physicians tend to focus on diagnosing illness, NPs’ training encourages a wellness-first approach. While physicians are more likely to have gridlocked schedules, NPs by design spend more time with patients. While a physician may be focused on finding the right treatment for stubborn high blood pressure, NPs also look at your diet, exercise and sleep schedules to find underlying causes. In the end, there is no one right answer in choosing a PCP, but there are important considerations to weigh before you make your decision. Here are five smart questions to help guide your choice. 1. Do they have the right bedside manner? Take the time to meet with your potential PCP to see how you relate to one another. Do they put you at ease? Do they listen and answer your questions? Do they explain things in terms you understand? Do you trust them? Answers to these gut questions will help you make your decision. 2. What are the office logistics? Getting a glimpse into how the office handles calls, appointments, lab work, prescription refills and help lines will influence your experience. Long wait times and limited appointment availability are usually red flags, for example. Practices led by NPs or that use NPs tend to have more availability and better follow-up etiquette, so take note of the team and who’s wearing the stethoscope. 3. Are they equipped to oversee your entire provider team? Because your PCP will be the quarterback of your entire health care team, it’s important to choose someone who is not only familiar with the intricacies of the various specialists and treatment options, but who also has the time to invest in the coordination of your health. Make sure your provider is committed to your care even when you’re not sitting right in front of them. 4. Are they well-liked? Finding a PCP can be a lot like finding the next best restaurant – the the good ones get a lot of recommendations. Because NPs tend to have very high satisfaction rates, many add patients based on word of mouth alone. 5. Are they culturally aware? There are tons of cultural nuances that influence how patients approach their health. Finding a provider who understands your native language, community norms, societal pressures and the factors that motivate your decisions is key. While physicians tend to practice in more affluent areas, NPs gravitate to where there is the greatest need, so inclusion and representation may be easiest to find in an NP. A good PCP knows your history, your personality, your bad habits and your treatment preferences, and they help you navigate your healthiest life by treating your sickness, but more intentionally, promoting your wellness. As we face a mounting physician shortage and changing paradigms for care, NPs are delivering primary care in a way that suits millions of Americans – in over 1 billion patient visits per year. The good news for patients is that there is more choice than ever. It’s what you do with that choice that will impact your health for years to come, so take the time to find a PCP that is right for you. Dr. Joyce M. Knestrick, CRNP, FAANP, is President of the American Association of Nurse Practitioners. Dr. Knestrick is also an Associate Professor at Georgetown University and practices as a family nurse practitioner at Wheeling Health Rite in West Virginia. She has over three decades of experience as NP serving low income and underserved populations both in urban and rural Appalachian areas. Dr. Knestrick earned a Ph.D. at Duquesne University in Pittsburgh, PA, a Master's Degree in Nursing with a focus on primary care from West Virginia University, a BSN from Wheeling Jesuit University an ADN from Community College of Allegheny County and a Bachelor of Science in Chemistry from Point Park College. A registered nurse for over 30 years, Dr. Knestrick has a variety of teaching experience at the diploma, BSN, MSN, and Doctorate level. As an organizational leader, she has served as an adjunct professor in organizational leadership master's programs. She has served multiple clinical roles as a family nurse practitioner, a nurse manager, and a registered nurse in critical care, medical, surgical, pediatric, and long-term care settings. Dr. Knestrick's research agenda focuses on the health of low- income populations with a focus on issues that impact those populations such as smoking, hope, spirituality, and access to care. As a nurse educator, she has over twelve years as a distance educator and has been a pioneer in distance education for nurse practitioners. Knestrick has served her local school district as an elected official for 12 years where she has also served as president of the board for nine years. She is a member of the West Virginia Nurses Association, Sigma Theta Tau International and the National Organization of Nurse Practitioner Faculties (NONPF) where she sits on several key NONPF committees. She and her husband of 40 years enjoy their time together with their three grown children and their three grandchildren.